A member of the public called for help after hearing the family shouting out. A FAMILY OF four were rescued today after they became trapped on rocks near Tullan Strand, Bundoran. A member of the public heard the family calling for help and phoned 112 to alert the Coast Guard. 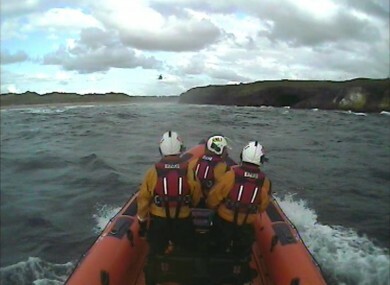 The volunteer crew of Bundoran RNLI Lifeboat were then paged by Malin Head Coast Guard around 17:50. Within minutes of the alert, the lifeboat was at the scene – however the water was too shallow to bring the boat closer to the family. The Sligo based Rescue 118 helicopter was then called to winch the family onto the beach where they were met by members of the RNLI Shore Crew. Helmsman Dessie Daly said, “the situation may have been much worse had the member of the public not heard the shouts for help. Email “Family of four trapped on rocks winched to safety by helicopter”. Feedback on “Family of four trapped on rocks winched to safety by helicopter”.